The worldÂ’s most famous hotel training academy Â– the Cornell University School of Hotel Administration Â– will return to Australia for the first time in 25 years giving local hotel executives the opportunity to hone their skills in the industry. Australian Hotels Association (AHA) and its subsidiary Tourism Accommodation Australia (TAA) in partnership with Tourism Training Australia (TTA) secured the agreement for Cornell to conduct their Senior Executive Development and Food and Beverage Executive Development programs in Australia. 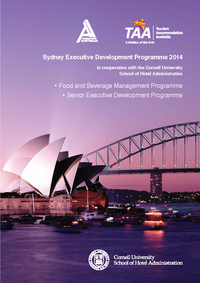 They will be held in Sydney between 26 Â– 29 May 2014. The Senior Executive Development Program will focus on the application of financial management concepts useful in analysing hospitality operations. Emphasis will be on communicating and interpreting financial data from a General Manager perspective so they can deal more effectively with the business and its owners. The format involves lectures, case studies and problem sets. The Food and Beverage Executive Development Program is designed for the Food and Beverage Managers, General Managers or Restaurant Manager seeking to gain a competitive advantage for their business. The course will develop abilities to innovate, identify and integrate trends in the industry, using operations based marketing, sales promotion, creating customer value through staff training and motivation strategies, menu development, forecasting, budgeting, labour scheduling and food production. AHA-TAA members interested securing placement in these programs are eligible for preferential registration and flexible benefits by registering and making full payment before Friday 20th December . Placements can still be secured at either the F&B Management Program or Senior Executive Program by registering and making full payment before Friday 20th December. Simply follow this link to the Registration Form 2014 to register your place.